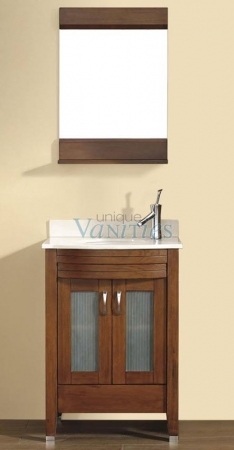 24 Inch Cherry Single Sink Bathroom Vanity, Choice of Top 24 Inch Single Sink Bath Vanity, 36 Inch Single Sink Bath Vanity, 42 Inch Single Sink Bath Vanity, 48 Inch Single Sink Bath Vanity, 63 Inch Double Sink Bath Vanity, 75 Inch Double Sink Bath Vanity. Counter Top: This vanity comes with a choice of countertop. Marble is a porous stone, and offers a unique look with its natural veining. Marble requires more maintenance than other natural stones, but can last a lifetime if taken care of properly. Marble can be damaged by acidic foods and cleaners, and is more vulnerable to scratches and etching (water marks) if not dried routinely. It is recommended that you seal Marble every 3 - 6 months. Tempered Glass is one of two kinds of safety glass regularly used in applications in which standard glass could pose a potential danger. Tempered glass is four to five times stronger than standard glass and does not break into sharp shards when it fails. Tempered glass is manufactured through a process of extreme heating and rapid cooling, making it harder than normal glass. Itís an excellent material for bathroom countertops, and requires little maintenance. Light Assembly Required: The countertop and sink may not be attached to the base cabinet. If not, this will require attachment by use of silicone (not provided) and additional hardware (provided). Some furniture style vanities are shipped without the feet attached, which require installation by simply screwing in, all parts included. If additional accessories are included, such as faucet, mirrors, etc., these accessories will require installation. Includes an open space for plumbing accessibility. 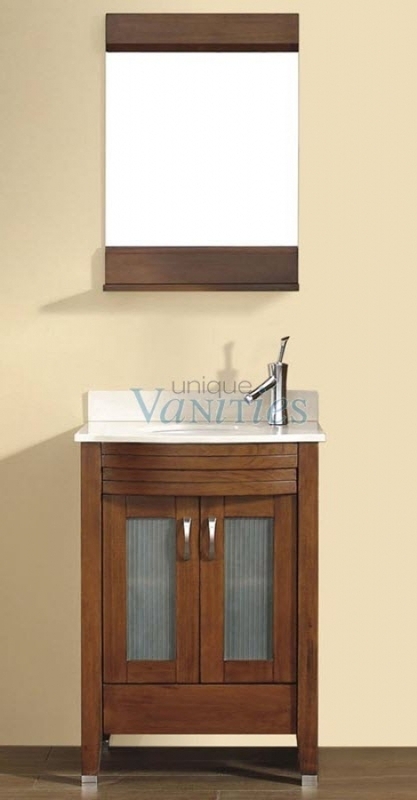 "> 24 Inch Single Sink Bath Vanity, 36 Inch Single Sink Bath Vanity, 42 Inch Single Sink Bath Vanity, 48 Inch Single Sink Bath Vanity, 63 Inch Double Sink Bath Vanity, 75 Inch Double Sink Bath Vanity. 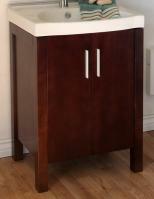 The elegance of light cherry brings functionality and beauty to your bathroom with this single sink vanity cabinet. Create a look that matches your style by choosing from white marble, beige marble or a green tempered glass counter top. The cabinet features a compact under sink storage space with an interior shelf. A single drawer rounds out the storage options. Bought this vanity, nicely built, not really a cherry color per say, more brownish, top nice stone but Back Splash was Broke, so not happy on that.